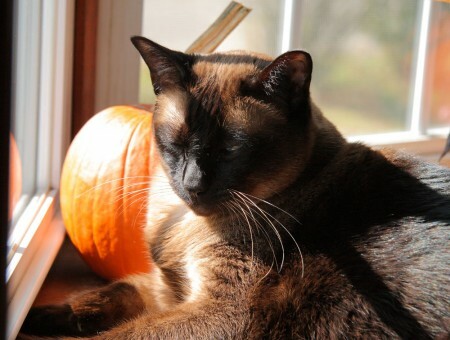 Mason found a great sunny spot by the bay window this weekend. The addition of the pumpkin sets the perfect autumn mood, I think. Hope you found some autumn beauty this weekend, too! Aw. Such a pretty shot! Love the warm yellow/ orange light on him! What a beautiful cat! Nothing more content that a cat in a sunbeam. He is one handsome cat. What kind is he? I love sunshine on cats’ fur. Your boy is one handsome dude. Clearly he rules the roost. Great pic! I am coveting your cat’s sunshine, though. Somehow December arrived over the weekend. My, what a handsome Meezer! Great photo! Mason is quite the handsome kitty! Looks like a happy, content kitty. Great shot with the pumpkin. Right in my own back yard — there’s a maple in one corner that always leads the annual display. Very autumn! Very Nice photo! Aw, kitty! I just want to snorgle him, right in his sun-warmed fur. You can just feel the warmth of the sun! Mmmmmm. Time for a little nap! That’s a great spot! Looking especially nice and cozy since I have some sputtery snowy stuff outside my window right now. Bleh. Carole, I am driving to Rhinebeck this year from Pgh. Are you able to get Yuengling in New York? If not, let me know and I can bring a case or two.